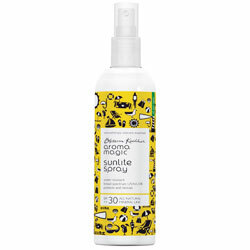 Buy Aroma Magic Sunlite Spray SPF 30 PA++ - Water-Resistant - Moringa Extracts Rejuvenates Skin & Provide Smart Sun Protection. Broad-spectrum UVA/UVB. Protects and revives. All skin types. All-mineral, water resistant formula creates a physical barrier between you and the sun. Non greasy, skin friendly and enriched with hempseed, rosemary and macadamia oils. Notes of lavender, chamomile and helichrysum essential oils revive and protect your skin. Moringa extracts rejuvenate the skin and provide smart sun protection. Shake well and spray me generously 15 minutes before sun exposure and revive your sunscreen for desired protection. Distribute evenly for a great, light after-feel. Reapply every two hours or when you break out in a sweat. A Perfect complement to your daily make up routine too. Note : Avoid contact with eyes and mouth while spraying.